Heifer International and other live animal charities may not be as beneficial as previously thought. Livestock operations set up in poor countries displace indigenous agriculture, forests and farmers and pollute the water and land while introducing Western diets that are notoriously unhealthy. Obesity and diabetes often follow. Scratch the surface of "feed the world" campaigns and you often find Big Food/biotech seeking new markets for their chemicals, pesticides, GMO seeds, fertilizer and animal drugs. Every year during the holiday season, Americans receive a marketing catalog in the mail from Heifer International, a religiously based Arkansas live animal charity. Decorated with photos of cute animals and cute poor children who will eagerly receive them, it seems an appealing charity. What's not to like? Last year, its materials even put animals in Christmas sweaters. Many public figures and leaders have supported Heifer International including Sheryl Crow, Ashley Judd, Barbara Bush, Ben Cohen, singer Bonnie Raitt, Diane Lane, Ed Asner, Ellen DeGeneres, Mia Farrow, Martha Stewart, George Bush Sr., Goldie Hawn, Bill and Hillary Clinton, Meryl Streep, Martha Stewart, Oprah Winfrey, Jane Fonda, Stephen King and Susan Sarandon. But there's a lot not to like about Heifer International and other live animal charities. While the animals in the photos are made to look like pets, they present very real non-pet problems. Ask anyone who raises livestock for a living about the cost of diseases, food, housing, biosecurity and veterinary care, and you'll see livestock is no gift at all. Supplying live animals to poor people is especially outrageous in light of the outbreaks of swine flu and bird flu which have sickened thousands across the world in the past years. "Are there systems in place to teach people to care for their new animals?" asks the Verge about a Heifer donation to Bolivia. "Who determines who gets a chicken and who doesn't, and will that distribution foster ill will? How would introducing livestock to a community or region impact existing economies? And, most importantly, do the recipients even want the gift?" Addressing the paradox of poor people with minimal food and shelter caring for animals requiring food and shelter, one Heifer International communication actually says the poor should "buy" food and supplies. Visitors to villages that have received Heifer International gifts tell a different story. They have reported whole flocks of birds that died from diseases and children sleeping with their animal gifts so they are not stolen. One mother whose son visited a demonstration Heifer International village in the U.S. says her son was traumatized for years by seeing a rabbit unceremoniously slaughtered in front of children by the Heifer International leader. In Chicago, Heifer International has attempted to set up aquaculture operations to pull poor ghetto kids out of poverty twice. Both times, all the fish ended up dying. Heifer had hoped the tilapia—a fish bought for pennies and capable of growing to two feet—would provide nice meals for housing project dwellers. Additionally, the project would provide young people, "job readiness skills" and teach them to be "stewards of the natural environment and their community," while providing an income from sales to local restaurants, said Heifer. The "natural environment" Heifer setup—fish squeezed into 55-gallon containers—could even be extended to Chicago's 70,000 vacant lots and start including sheep, goats and cows, said Heifer. In 1999, all the fish froze to death when the heat and power were cut to the building, some say deliberately. And in 2001, the fish died of heat when power went off during a storm, some leaping "out of their barrels trying to escape accumulating ammonia and rising temperatures," according to the Chicago Tribune. Not one fish was sold to a restaurant. 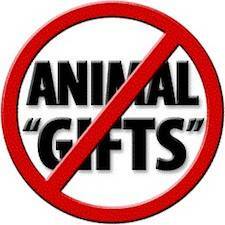 How will people in poor countries keep their animal gifts from dying, when even poor people in Chicago can't? Expecting poor people to have the money, resources, know-how and desire to raise livestock is only half of Heifer International's problem. Many Asian, African and indigenous people are lactose-intolerant, making dairy foods inappropriate and even ridiculous. That didn't stop the Gates Foundation from giving Heifer International millions to set up dairy enterprises in rural African villages in Kenya, Uganda and Rwanda replete with "chilling plants" and "refrigerated commercial dairy delivery trucks." Nor are cheese, bacon and eggs even the solution to world hunger. According to the World Food Program, hunger comes from climate change, poverty, unstable markets, war and displacement—not lack of animal and processed protein. In fact, its High Energy Biscuits provide up to 15 grams of protein from grain. Luckily, there are plenty of charities, some found on A Well Fed World, that address world hunger without subjecting poor people to new expenses and animal-borne diseases for foods that are not even healthy or appropriate for them.